Pouch laminators are used to laminate small ID size cards up to large size documents such as 12"x18" menu-size pouches. Pouches are 2 pieces of precut laminating plastic sealed at the top to form a pouch. Laminating pouches come in a wide range of sizes and thicknesses. Laminating is easy and requires no special training.To laminate insert your document into the pouch, place the pouch and carrier into the pouch laminator and within seconds the item is sealed and protected. The carrier is used to provide stability to the laminating pouches and is used to protect the rollers from any excess adhesive that might adhere to the rollers. The pouches are precut to a specific size there is less need for trimming. DISCOUNT PRICES & GREAT SELECTION ON ALL LAMINATING POUCHES . 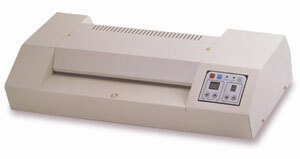 FREE SHIPPING ON ALL POUCH LAMINATING MACHINES. With Heated Rollers, LED Display, Adjustable Speed, Plus Auto Memory. 6 Roller Design with 4 Heated Rollers and Overheat Protection. 7 Memory Settings, 9 Adjustable Speed Settings. Laminates up to 11.8' Per Minute And The 10 Rollers Design Allows You To Laminate Photos, Inkjet Prints and Color Copies With Bubble Free Crystal Clear Results.